Dogs can get cancer in many of the same body systems as humans–skin, liver, reproductive system, bone. We know quite a bit less about cancers in dogs than in humans. What we do know suggests that early identification and treatment is critical. While some dog species carry a genetic susceptibility to certain cancers — Great Danes and Greyhounds have a higher rate of bone cancers, for example — the majority of cancer in dogs is related to aging. Dogs over ten years old are more likely to die of cancer than younger dogs. About half of deaths in the older dog are cancer-related. Male dogs are at risk for cancers of the reproductive system, such as testicular cancers and prostate cancers. We can decrease the incidence of testicular cancer in dogs by neutering at a younger age. Prostate cancer, which is age-related, has a high rate of metastasis. Many times the symptoms are very non-specific until the cancer has spread to other organ systems. When prostate tumors begin to grow, they can obstruct the urinary system. Dogs may have difficulty emptying their bladders, and may develop urinary tract infections, dysuria, or signs of painful urination. In an older male dog, any signs that urination is compromised suggests the need for an evaluation for prostate cancer. Because prostate cancer in dogs has such a high rate of metastasis, many times a systemic illness is noted first. Lethargy, shortness of breath, weight loss, and poor feeding are often first signs that something is wrong. Female dogs that are spayed early have decreased incidence of mammary tumors, but these cancers can occur in any dog. Any area of increased density, hardness, or an overt tumor or lump that is felt on the chest or chest wall should be evaluated as soon as possible. These types of cancers tend to spread to other systems. Skin cancers can appear as either lumps that are changing or growing, or sores. Light-colored animals tend to have a higher risk; but there is no science at this time to suggest breed-specific risk for skin cancer in dogs. While some skin cancers can turn malignant and spread, many can be treated locally through surgical removal, with no further adverse effects on the animal. Significant sun exposure during the lifetime of the dog can increase risk. Large dogs are more sensitive to bone cancers, and there may be some breed susceptibility for Great Danes, Greyhounds, Golden Retrievers, Bernese Mountain Dogs, and other large breeds. These canine cancers are aggressive and they can spread quickly; early signs can be a limp or other gait abnormality, disinclination to go on walks/runs, or signs of pain. Some dogs develop different positioning, in which they lie down to sleep in a very specific way. Many of these signs are related to pain; other painful conditions of the bones and joints, such as arthritis, can be the cause. Late signs that the cancer has spread to other organ systems are weight loss with feeding problems, behavior change, lethargy, and shortness of breath with activity. In humans, chronic disease such as liver disease can lead over time to cancer developing in that organ. We have not identified a similar relationship between cancers of the liver and GI tract in dogs and chronic illness. These cancers tend to be aggressive and they spread quickly, with systemic illness being in many cases the first signs. Systemic illness means the dog appears generally ill, with sleep and behavior change, signs of pain, changes in food and drinking behaviors, weight loss, exercise intolerance, and an inability to walk or run. Changes in stools, such as significant constipation and thin, ribbon-line stools should be evaluated. However, many benign conditions such as changes in food also produce changes in bathroom behavior. Palpating the abdomen can sometimes allow a veterinary to feel a tumor, but this is a very late sign, and can produce pain in the dog. Owners should not try to feel a dog’s abdomen for lumps or tumors at home. Problems with teeth, which can include oral cancers, broken teeth, and abscesses, can impact eating, weight, and behavior, as tooth problems can be painful and lead to infection. It’s usually recommended if an owner suspects a problem with teeth that professional staff be allowed to assess the problem. An infection can present with the above signs, and also fever. Many dogs will show signs of pain or behavior change with a mouth or tooth problem. The aggressive nature of cancer in dogs, the high risk of metastasis to other organ systems, and the strong relationship to advanced age means there is often little early warning or prevention available. While there are specialty clinics that offer chemotherapy, radiation, and surgery for cancers, these clinics are not available in all communities. Our best options involve early monitoring and diagnosis, and this requires vigilant, careful owners and access to veterinary medicine. 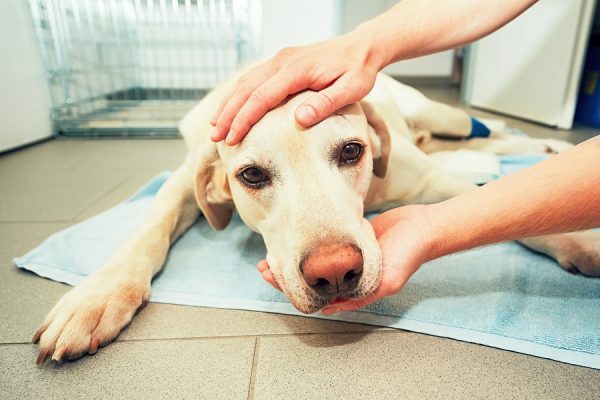 The warning signs that your dog needs to be evaluated for canine cancer are any sign of painful or altered gait, such as a limp, or positioning to suggest the animal is in pain. A dog who’s always loved walking or running, and now doesn’t want to go outside or play, should be evaluated. Any sore or lump around a joint should also be evaluated. Anorexia, or not wanting to eat despite weight loss, is a worrisome sign for a systemic illness. Not being able to drink water and urinate is of more immediate concern, and that symptom needs to be checked without delay. Lethargy, sleeping more, taking naps are all signs that are nonspecific- this means they can be related to a number of conditions both serious and benign. Seasonal changes in sleeping patterns, age, stress such as a new pet in the home, and other changes can cause dogs to sleep more. A change in sleeping pattern combined with signs of pain, and weight loss, however, tends to be more serious, and this group of three symptoms together should be evaluated without delay. Do you have a concern about your pet? Please contact us for an appointment.